Posted on April 15, 2019 by admin in - WOW! 29 1/2 x 21 1/2 in. Salvador Dali often explored literary characters in his works. Tristan and Isolde or Don Quixote are well-known series of work by the artist. He also created work based on the romantic novel Ivanhoe. This week’s Work of the Week! WOW! is Rowena, from Ivanhoe Suite. Ivanhoe was written by Sir Walter Scott in 1819. The story was set in medieval England during a time of political tension between the Anglo-Saxons and Normans. This created a divide between the protagonist Sir Wilfred of Ivanhoe and his father. Ivanhoe, the son of a wealthy nobleman and of Anglo-Saxon descent was disinherited by his father Cedric of Rotherwood for supporting a Norman king, and for falling in love with Lady Rowena whom Cedric looks after. Ivanhoe and Rowena are in love throughout the novel, however Cedric forbids their marriage as he would like Rowena to marry Lord Athelstane, a powerful Anglo-Saxon contender for the crown. During a jousting tournament, Ivanhoe is wounded and his healer, Rebecca falls in love with him. 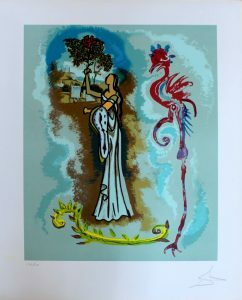 So many obstacles lie in the path of Ivanhoe and Rowena to marry, which Dali captures through symbolic images. Rowena is seen holding a melting clock, one of Dali’s most iconic images, which symbolizes the lost time for the two lovers. Rowena is holding a single rose, which symbolizes Ivanhoe and his love for Rowena. Another meaningful image is the presence of a seahorse with Dali’s ever so famous stork legs. The seahorse was considered a good luck charm in many old cultures, symbolizing the strength of the subconscious and persistence, which is relevant to the two lovers character and their desire to be together. Despite the obstacles, Ivanhoe and Rowena are together in the end. Rebecca leaves England to study medicine in Spain, and Cedric of Rotherwood gives his blessing for the two to marry. Posted on April 8, 2019 by admin in - WOW! 44 x 30 1/2 in. 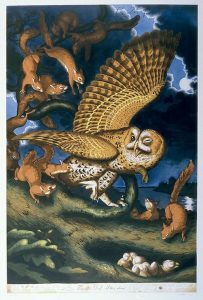 Walton Ford is a contemporary American painter and printmaker who draws on the visual and narrative language of traditional natural history painting. 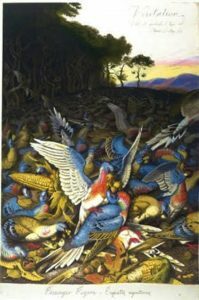 He examines how animals exist and survive in relation to human activity, many of the animals he depicts being extinct. Although human figures rarely appear in his work, their presence and effect is always implied. This week’s Work of the Week! WOW! is a suite of 6 etchings by Walton Ford. Ford’s color etchings are deeply inspired by 19th century American ornithologist and painter John James Audubon, but they aren’t just a celebration of the natural world like Aududbon’s works. 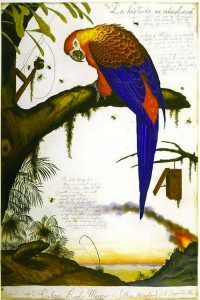 Ford’s paintings are meticulous, realistic studies of flora and fauna, filled with commentary – symbols, clues and jokes referencing text ranging from colonial literature, to folktales, to travel guides. His works are complex, allegorical narratives that critique the history of colonialism, industrialism, politics, natural sciences and humanity’s effect on the environment. In the work entitled Visitation, for example, Ford’s scene of a large flock of passenger pigeons can be seen eating corn and nuts, and recalls a written description by Audubon, “Whilst feeding, their avidity is at times so great that in attempting to swallow a large acorn or nut, they are seen gasping for a long while as if in the agonies of suffocation.” The overwhelming amount of birds feasting on the bounty of the land could symbolize the exploitation of natural resources by European settlers in the New World, which ultimately led to the extinction of the passenger pigeon. Another American bird represented in this series can be seen in the piece Benjamin’s Emblem. This is a direct reference to the myth that Benjamin Franklin wanted the turkey as the emblem of the Great Seal of the United States – his proposal for the seal was in fact devoid of birds completely. The turkey in Benjamin’s Emblem is asphyxiating a small Carolina Parakeet, an extinct bird, once the only parakeet indigenous to North America. 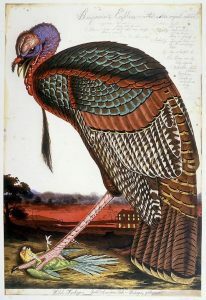 The wild turkey was the very first print created for Audubon’s Birds of America, celebrating wild American birds. The wild turkey was Audubon’s most idolized, writing about it more than any other in his Ornithological Biography. He sealed letters with a seal bearing the likeness of a turkey and the words “America My Country,” even adopting one as a pet. 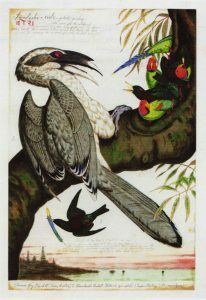 Each bird of the series has a story related to human activity such as Colonialism, Imperialism and even Communism, and their ecological effects on nature, specifically birds. 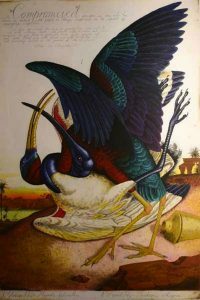 Walton Ford’s work can be found in many public collections in the US, including the Museum of Modern Art, NY; Whitney Museum of American Art, New York; and the Smithsonian American Art Museum, Washington D.C.
Posted on March 26, 2019 by admin in - WOW! 39 1/4 x 39 1/4 in. When you were young did your parents ever say . . . If your friends jumped off the Brooklyn Bridge would you follow them? Mine did all the time, and we did not even live in Brooklyn, let alone New York. Along with the Golden Gate Bridge, The Brooklyn Bridge is the most well-known and beloved bridge in America. It is an American Icon, representing American ingenuity, American grit, and American pride. The is why Andy Warhol chose to paint fantastic modern day marvel. This week’s Work of the Week! WOW! 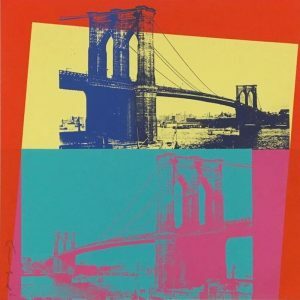 is Andy Warhol’s Brooklyn Bridge. Completed on May 24th 1883, after 14 years of construction, the Brooklyn Bridge set many records, it was the world’s first steel-wire suspension bridge, the first fixed crossing across the East River, and at the time it opened, the longest suspension bridge ever built by 50%, it is also one of the oldest roadway bridges in the US. In 1964 The Brooklyn Bridge was designated a National Historic Landmark by the National Park Service, and in 1972 became a New York City Landmark by the Landmarks Preservation Commission. In 1983, The Brooklyn Bridge celebrated its centennial anniversary. Exhibitions, lectures and performances were organized, including a 9,600-rocket firework display. President Ronald Reagan was also part of the festivities, leading a formal procession of cars along the bridge to mark the start of the celebrations. The entire production was put together by the Brooklyn Bridge Centennial Commission, which produced a brochure listing all the related activities taking place from May through October of 1983. It seems only fitting then that the Commission approached another American and New York City icon to create the official celebration image: Pop Art star, Andy Warhol. Warhol’s depictions of iconic American symbols are what lead to his rise to the most famous American artist of the 20th century. He captured the political and commercial strength of the post-war American era and gave them an artistic platform. As with most of his work, the imagery of Brooklyn Bridge is based on actual photographs. What is different in this case is the use of multiple images, as opposed to just one. The juxtaposition of the two images better captures the power and symbolism of the Brooklyn Bridge as one of the greatest American engineering feats of the 19th century. To create a visual 3D effect of the bridge on a 2D medium, Warhol used color block techniques and multi-layer superimposition of colors, tricking the eye to think the bridge is popping out of the sheet. Posted on March 18, 2019 by admin in - WOW! Mickey and Minnie Mouse are probably the most iconic duo of Pop culture. Developed as the official mascot of the Walt Disney Company, in the 1920’s, Mickey’s celebrated status and universal appeal has inspired many artists to depict his likeness, very few however, have also created Minnie. This week’s Work of the Week! WOW! are Mickey and Minnie by Damien Hirst. The key defining factors of both Mickey and Minnie Mouse are the three circles that form their head and ears. It seems only fitting then, that the Walt Disney Company would approach Damien Hirst, widely known for his spot paintings, to create his own take on the beloved characters. 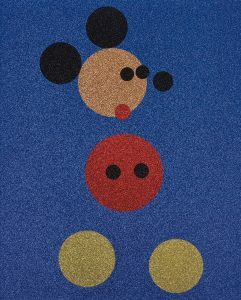 Hirst initially painted Mickey in household gloss on canvas in 2012, with a white background, auctioned at Christies to raise money for Kids Company, a children’s charity. The work sold for close to 1 Million Pounds and led to the creation of “blue glitter” Mickey and “pink glitter” Minnie. Both figures are created solely by the use of circles, striking compositions reducing the mischievous mice to their basic elements, capturing their essence through shape and color. Even in their reductive states, Mickey and Minnie are such powerful icons that they remain highly identifiable and universally recognized. Mickey only required 12 spots and Minnie 19, attesting to the power of Hirst’s style and composition. Both pieces are entirely covered in glitter which enhances the timeless star-power of the enduring and beloved personalities of Mickey and Minnie. 34 1/4 x 30 1/4 in. 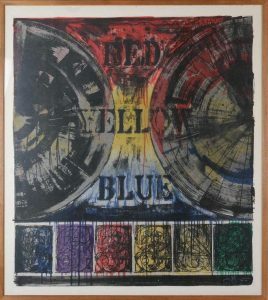 In the mid 1950s Jasper Johns, one of America’s most renowned artists, began experimenting with symbolism in the form of flags, targets, numbers and text in his work. His use of symbols was in stark contrast to the predominant introspective abstract style at the time. Johns’ formula examined representation, revealing the ways in which the art object itself expresses meaning. In representing symbols, that were not usually represented in high-art, Johns challenged the viewer to see something new, to question accepted conventions and be inquisitive as opposed to complacent, transforming the ordinary into rich visual objects. He explored the impact of changes in color, scale, sequence, and medium, favoring subjects that “the mind already knows” but overlooks. This week’s Work of the Week! WOW! 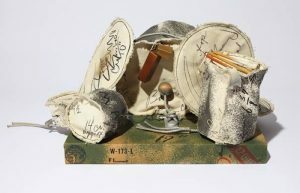 is Untitled 1977-1980, a work that encompasses 3 recurring symbols of Johns’ body of work: the device, text and numbers. This work came to be by Johns’ famously use of Savarin cans to hold his paintbrushes. One day while looking at the can, Johns realized that the label printed and affixed to the cylindrical can, transformed from a flat sheet when wrapped around the form. The label runs around the form in a continuous band suggesting that some of Johns’ work can be seen from the same perspective. Starting with the two half circles that create most of this image, the easiest interpretation can be that these half circles represent the actual Savarin can, which in one way it does. However, upon a deeper interpretation of work, we come to see many different representations of these half circles. These circles were created by a device that Johns invented by which he attached rulers to each side of a wood frame, and used the rulers as a pendulum which will spread the paint over the work in a semi-circle. This device removes the hand of the artist, and forces us to see the artwork for what is it, and not for who painted it. It bears a Duchamp like quality, an idol and huge influence on Johns. The two-dimensional nature of the sheet, plays into what the mind already knows, but overlooks. Although divided in half, appearing in reverse order in the representation, the stroke that the rulers create look like the bottom of the cylinder Savarin can, and when the paper is rolled with the two edges touching, the two half circles create the single image of the cylinder. The composition of the piece is extracted from an everyday object transformed into art. Written words are where the worlds of thought and representation meet. The use of text automatically invites the viewer to read from top, left to right, downwards (which “the mind already knows”), giving the work the preconceived notion of direction. The words and colors red, yellow and blue take on meaning of their own, as primary colors they are the foundation on which all other colors are created. This is addressed in the lower portion of the work. As previously stated, in considering this work as a flat cylinder the edges are supposed to connect as if three-dimensional. In connecting the two edges of the sheet, the color wheel takes shape. In the numerals portion, the blue at the extreme left is separated form the green at the extreme right. 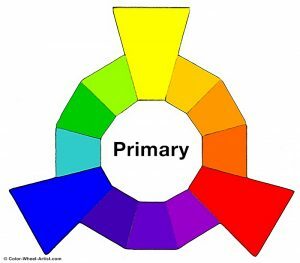 In between, we have the additional colors and shades completing the color wheel. The numbers represented in the color wheel at the bottom of the work address perception and representation. Each number from 0 to 9 is superimposed one over the other, scaled to fill the delineated space in 6 rectangles. While each number is visible, each is difficult to discern individually. Their forms are created from stencils, further challenging perceptions between the connection of high-art with the banal. Johns’ transformation of everyday symbols into art objects reflects his interest in the nature and connections between “what the mind knows” and what the eye sees. His technical expertise in exploring these concepts results in this stunning and captivating work. In the Fall of 2020, both the Whitney Museum of American Art and the Philadelphia Museum of art will be collaborating with the artist in an unprecedented joint retrospective of Jasper Johns’ career. 38 x 38 1/2 in. Frank Stella is widely known for his concern with geometry, precision and rationality that characterize Minimalism. 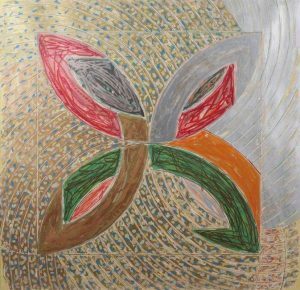 By the late 1970’s, his work had evolved to become more complex with visible brushstrokes and experimentation with combinations of shapes, colors and printing techniques. Despite his progression towards more dynamic work, the grid base of Stella’s earlier creations remained an integral element of his style. This week’s Work of the Week! WOW! is Polar Coordinate for Ronnie Peterson – VII, a hand-painted, mixed media unique work, of which only 5 unique pieces were ever made. The Polar Coordinates series is dedicated to his friend Ronnie Peterson who was a Swedish auto racer. During the time Stella was working on the series, Ronnie Peterson died at the Grand prix at Monza in September 1978. The theme of racing is one that would appear again in Stella’s Circuits series and Race Track series. In his reinterpretation of the polar coordinates, Stella activates the graph paper to become lively and vibrant, a spinning energy evocative of the momentum of racing. The title of the series stems from mathematical polar coordinates graph paper, which consists of lines emanating from a central point. Each print from the Polar Coordinates series was created from multiple layers of screenprinting and lithography. The lithographic plates determined the grids, outlines of the shapes and rapid line drawing in the form of superimposed netting. Photoscreens created from washes and crayon drawings on Myalr were used for the tonal backgrounds and flatter colors, including the metallic inks and GitterFlex. This hand-painted mixed media version, available from Gregg Shienbaum Fine Art, differs from the regular edition in various ways. Firstly, the metallic silver is hand-applied by the artist without certain of the superimposed lithographic rapid line drawing elements. Secondly, the two bisected quatrefoils which create the image, are hand-painted in different colors and with differing elements of rapid line drawing. In some instances, Stella removed some of the rapid line drawing and in other instances added them to this image. 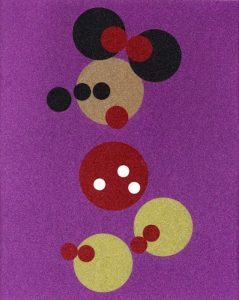 These mixed-media hand-painted versions were Stella’s color trial proofs and studies that eventually led to the regular edition of Polar Coordinate VII. 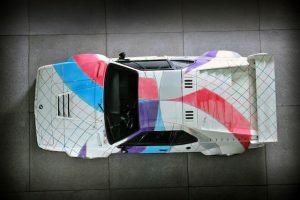 An interesting addition to the series and further tribute to Ronnie Peterson is a BMW which was hand painted by Stella in 1979 as a custom work for another race car driver and close friend, Peter Gregg. 15 h x 6 dia in. 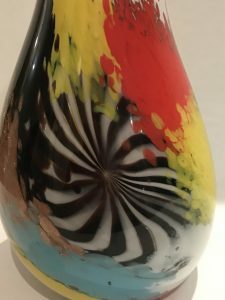 Art glass created by Dino Martens is some of the most recognizable Murano glass from 20th century Italian art. His innovative use of bright metallic colors using huge murrini (glass rods with colors or images in them) and fantastical shapes make Dino Martens one of the great creators of modern art. Martens was born in Venice in 1894. He went on to study at the Accademia di Belle Art, where he developed his skills as a painter. He exhibited in Venice as a young man in the 1920’s and by the end of the decade was a designer for Salviati & Co, a leading glass maker. After fighting in the African War, he took up the position of artistic director at Aureliano Toso. 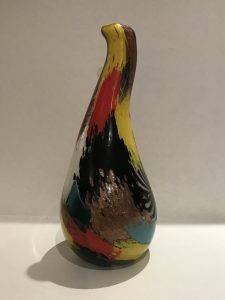 They were a famous Venetian glass maker where Dino became a legend. There he experimented with creating astounding designs that pushed the boundaries of what was possible with glass. A great example of one of these legendary designs is his Oriente series. 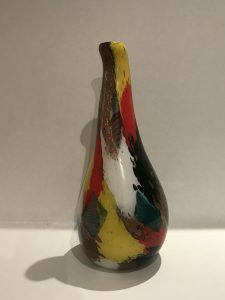 A vase from this series encapsulates the energy and vibrancy of his work and life. He played with form and color, putting unusual colors close together and playing them off each other. All the while intriguing the eye with almost biological shapes. This weeks WORK OF THE WEEK (WOW! ), is the Olaf Vase model 3122, from the Oriente series. When he designed the series “Oriente”, Martens seems to have been inspired by bright African patterns and colors. He combined bold, asymmetrical shapes with adventurous patterns requiring the highest glass making skills: aventurine copper or gold inclusions, spiraling “Zanfirico” glass canes, and murrains. 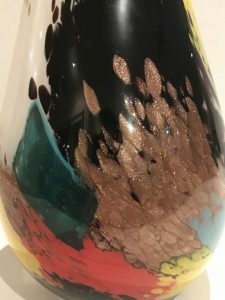 The Oriente series, making its first appearance at the Biennial of 1952, form the culmination of numerous experiments diffusing the borders between a painting and a glass vase. The first step of the the Oriente technique is the cold alignment on a flat surface of the ground glass, the colored square pieces, a number of short zanfirico canes, and in the majority of instances, a star shaped glass piece. The star is typically made of black and white canes. The resulting arrangement is then slightly heated, and picked up with a colorless glass bubble, incorporating the decoration in the glass wall. 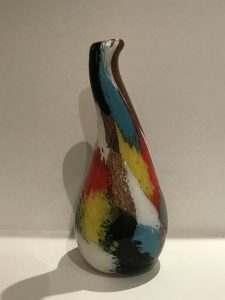 This technique and design was a tremendous commercial success, and brought Dino Martens’ reputation as a glass maker to the forefront of Italian glass making. The Olaf Vase stands 15 inches tall, and has a large bulbous bottom of 6 inches in diameter. 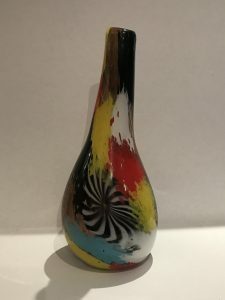 It is a very impressive work combining and fusing hot bright colors with specs of aventurine, and various canes competing against each other, creating a sense of a fast paced motion in a stationary vase. Its shape lends to this sense of motion. The Oriente design is is one of Dino Martens’ most recognizable, and most important design, that has remained timeless over the years. 9 3/4 x 19 x 13 3/4 in. In the early 1960’s the artist started to experiment with soft medium, defying the traditional rigid and static nature of the sculpture. With these works, Oldenburg proposed an alternate form, the “soft sculpture” which exists in a state of constant change. The “soft sculpture” has no fixed form, it is subjected to the forces of movement and gravity and configurations can be changed at any time. This innovative approach transformed the very definition of the sculpture. This week’s Work of the Week! is Oldenburg’s Miniature Soft Drum Set. Oldenburg might be most famous for his monumental structures, however, he worked with scale in all capacities. The soft drum set was originally designed in 1967 as a large sculpture, inspired by the architecture of the Guggenheim Museum, but the small-scale model, created as the prototype for the project, became the basis for the miniature edition. The notion of enlarging or diminishing everyday objects such as the drum set takes from the Surrealist movement and the concept of the absurd. In dramatically shifting the scale in his works, Oldenburg transforms the relationship between the viewer and the object through shrinking us or, in this case, enlarging us. Another absurd element of the artwork is that while the it depicts a drum set, the soft material entirely removes the function of the musical instrument. With the rigidity necessary for percussion absent, the drums cannot make a sound, instead, we are faced with a flaccid, unstructured canvas – a gentle commentary on our material world of object fetishism and our relationship to consumer goods. The Miniature soft drum set is comprised of 9 hend-sewn, screenprinted canvas “drums” with additional collaged elements such as wood, plastic and rope. 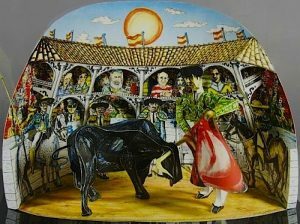 It is presented on a wooden base, created specifically by the artist, and accompanied by a set of six suggestions for display positions. The instruction manual allows the viewer to creatively participate in reassembling the work into various configurations which simultaneously gives the work multiple identities.